You know how your energy bills are so much worse than they were? Opinion The government's Department of Energy and Climate Change, with the current minister as mouthpiece, has just pushed out a report claiming that its green policies are saving us money now and will save us even more in coming decades. Can it be true? We can save the planet - or anyway reduce carbon emissions - and it not only costs nothing, but puts money in our pockets? In a word, no: of course not. If that was true there would be no need for government action, we'd be acting to reduce carbon emissions on our own. And indeed, once you skip the foolish tinned quotes and bogo-stats in the executive summary, the report itself (pdf) makes it very clear that in fact green policies are already to blame for most of the sustained climb in electricity prices we've suffered over the past decade - and that it's going to get a lot worse. The blue and brown bars are what you would pay without green intervention. The rest is thanks to the greens. So there you are, plain as day. 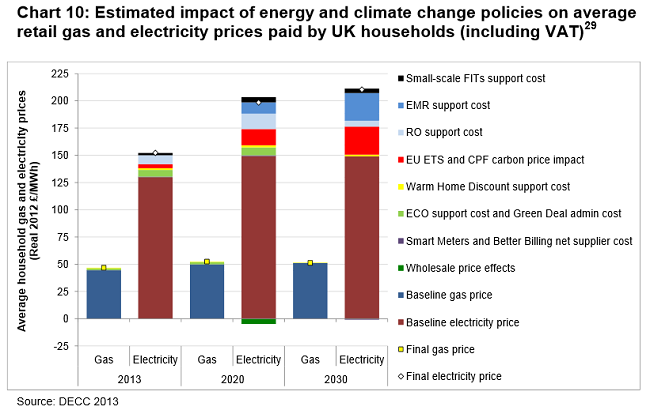 The various green interventions in the UK and EU energy markets which have come in since the turn of the century are already costing you a hefty sum - the government have already forced up the price you pay for electricity today by nearly 20 per cent over where it would have been if they'd left matters alone. If they carry on as planned, by the year 2030 they will have managed to drive it up by more than a third over where it would normally be. And in fact the green DECC mandarins who drafted the report are naturally seeking to cast themselves in the nicest possible light here. They admit the outright costs resulting from such things as the Renewables Obligation, which drives up electricity prices in order to pay for wind farms which - as they don't produce much power, and worse still can't produce it when it's actually wanted - would not otherwise be built. Electricity network costs have increased by around 20% in real terms since 2008. That's an awfully big jump in just a few years, especially since we're actually using less power than in 2008. What could have caused that? In other words the National Grid has had to build many new power connections to wind farms in remote and inaccessible locations, up hills, on moorlands and offshore. This has pushed up the "network costs" part of your electricity bill. And as more renewable power appears, it will drive up network costs a lot more, too. 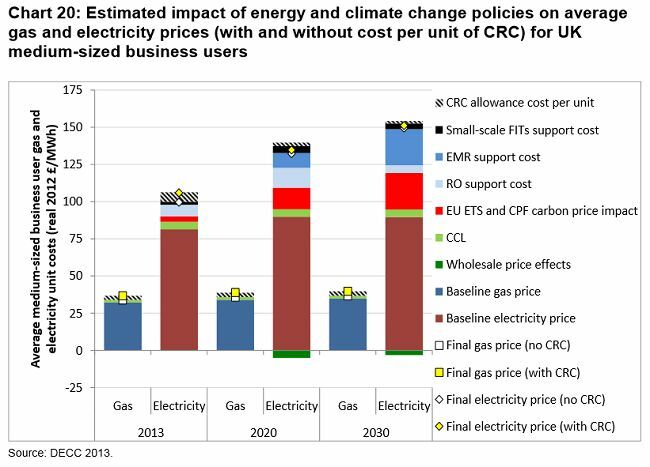 So, in reality, another four per cent (actually more, windfarms have been costing the grid extra money since well before 2008) of your electricity cost is down to Green policies imposed by the government, over and above what they admit in the chart above. Thus we see that the consumer price of 'leccy overall stands approximately 25 per cent higher today than it would have been if Whitehall and Brussels had left the UK energy market alone. That's quite interesting, as the DECC mandarins also admit that total UK electricity prices have increased by approximately 50 per cent in real terms since the turn of the century. Simple mathematics, then (150 x 100/125) tells us that if the green interventions had never happened this increase would have been only 20 per cent. In other words, the bulk of the electricity price rises ordinary Brits have suffered over the last twelve years have been caused by Green government policies. Not the evil gas markets, actually - it was mainly the government. And all for pretty much nothing: less than one per cent of the UK's overall energy comes from renewable electricity, with a correspondingly tiny impact on carbon emissions as nearly all the rest is fossil powered. You don't need to be a carbon sceptic to see that this plan is painfully expensive, set to get a lot worse, and producing very little in the way of results. We made electricity more expensive. You paid more for a more efficient fridge. Assuming the fridge didn't cost anything and we didn't make the power more expensive ... we're saving you money! This amazing figure is concocted by supposing that many of us are using more energy-efficient boilers, TVs, fridges etc than we otherwise would be; and that many of us have fitted our homes with energy-saving measures like double glazing, loft insulation etc; and saying that the government achieved all that because it specified that boilers, fridges etc must be more efficient, and because it compelled energy firms to offer payments and cheap loans for insulation and so forth (and authorised them to collect back their costs on this by raising prices). Not only are these figures no better than wild guesses, they are also astonishingly cheeky. First the government forces up the price of energy. Then it makes you spend money you wouldn't otherwise have spent (or makes other people help you spend it, as in cases of low-income households getting insulation etc cheaply at the cost of higher bills for everyone else) in a way which lets you use less energy. Then the government assumes that the efficiencies it made you spend money to get didn't cost anything, and claims it has saved you money overall! The good news is that, taken together, the Government’s policies mean that household bills will be on average 11%, or £166, lower in 2020 than if we just sat on our hands and did nothing. But if they had just had the decency to sit on their hands and do nothing to begin with, and kept on doing nothing, 'leccy bills would then be something approaching 35 per cent lower! And we wouldn't have had to spend extra on more expensive boilers and appliances unless we felt like it, nor on cheap insulation etc for poor folk to help them resist the crippling price rises imposed by green government. So we'd all be a damn sight better off: and our carbon emissions would only be a tiny amount higher than they are now. The government really loves SMEs, doesn't it? That's damn bad news if what you do involves using electric power. Anyone here in charge of any major IT hardware? The only good news in the whole report is that finally, after quite a few years of devastating economic hardship, the green hardliners at DECC are at last looking to ease the strain on some businesses - but only ones deemed to have high energy costs, which won't include very many Register readers. The canny Germans have always exempted a lot of business from their extremely harsh green policies - but this has thrown an even worse burden on the ordinary consumer, and there's a serious political row on in Germany as a result. To the degree the British government actually does anything to ease the strain on business, the same effect of making life even tougher for consumers will ensue. So, what can you do about this? Assuming you aren't perfectly happy to pay through the nose for trifling carbon savings, or to fit your house with largely useless photovoltaic panels mostly paid for by the rest of us (as we will also pay to ensure that your lights still come on in the dark when you actually need them). You would think that Labour might be against the green levies, as they are very socially unjust - the rich pay the same flat rates as the poor, meaning that they are unaffected while ordinary folk's lives are made seriously worse. But Labour actually brought most of these policies in. The Lib Dems, often the more right-on choice these days, are even more towards the green hardline than Labour is. And the Tories, dispiritingly, claim to be the "greenest government ever". That said, the idea that the grassroots Tory Party wants to be green is no more true than the DECC civil service hardliners' assertion that being green saves you money. Ironically perhaps, it's fairly plain that nasty old chancellor George Osborne - widely reviled as the oppressor of the poor - if left to himself would scrap the unfair, stealthy green energy taxes which hit the less well-off so much harder than the rich and have left so many poor folk shivering through the recent hard winter. There are many other Tory MPs and even some ministers of the same sort, though the party also has its green hardliners just as the others do. So taken all round, if you want affordable power more than you want tiny carbon savings - or if you care much about poor folk being cold in the winter - or if you just hate it when faceless bureaucrats take your money without asking if you wanted it taken and lie consistently even on the basic fact that they have taken it, let alone what they are doing with it ... you should probably vote Tory when you next get the chance, much as they are failing to do anything much about all this right now (due to being leg-shackled to the Lib Dems). And even those who would never do that - even the honest and decent sorts among the green hardliners reading this (experience suggests you are there) - might nonetheless want to pass on the word in other ways that lying is no way to convince people to support green action. By all means, you might advise your greenly inclined pals, say to people "we have already made you pay a lot more for energy, in order to reduce carbon emissions through use of renewables, and we would like to do much more of this".